"This recipe has boiled cabbage, smothered in a creamy white sauce, layers of cheese, then topped with more white sauce and bread crumbs. Yummy anytime." Preheat oven to 375 degrees F (190 degrees C). Grease a 9x13 inch baking dish. Place cabbage in a large pot of boiling water. Cook until tender, drain and set aside. Melt butter in a saucepan, then add flour stirring constantly. Gradually add 2 cups of milk. Stir on medium heat until thickened. Layer cabbage in bottom of the prepared baking dish. Pour 1/3 of white sauce over cabbage. Arrange six slices of cheese on that. Repeat, ending with white sauce. Bake in an oven at 375 degrees F (190 degrees C) oven for 45 minutes or until bubbly and browned. Let stand 5 minutes. Slice and enjoy. Makes A LOT if you have a family of 4, halve the recipe. 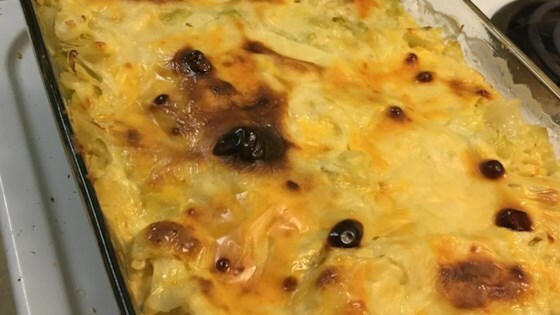 This recipe got a resounding "yuck" from my family- I even double checked to make sure I had done it right. Just followed the directions. I took it to a get together and everyone liked it. Not bitter at all -- sweet and cheesy. Make sure to let the white sauce thicken before spreading it. We liked it a lot. I liked it, but mainly because I used some delicious cabbage. The cheese was kinda runny and the overall appearance and texture was not appealing. It did not keep well in the fridge.